04/12/07 – UPDATE | SDTEKKEN.COM - TEKKEN News Resource! Animations have been changed for every character! All characters have an “item move”, like the Bryan shotgun we saw at the AOU trailer. Although not all of them will have the same effectiveness. An example of an “item move” will be Anna throwing her high heels at her opponents. Harada officially stated that Leo IS a girl. So far Yoshimitsu has gone under the most drastic change. Harada notes that it will be much more difficult to use Yoshimitsu this time around and they consider him an “Expert” character. Part of his story includes the fact that his sword is now losing power and he must take a new fighting style, Kenjutsu from the Manji clan, this includes both dual sword fighting and pure fist fighting! A lot of Lei Wulong’s laying down stances have been changed. They look more like Lei Fei and Shun Di’s laying down stance from Virtua Fighter 5. They also changed the properties where Lei can be counter-hit and juggled out of his laying down stances. Many changes were done to Marshall Law. It is noted that fans of Bruce Lee and those that know of Jeet Kune Do will be very pleased. That’s all the news for this month! 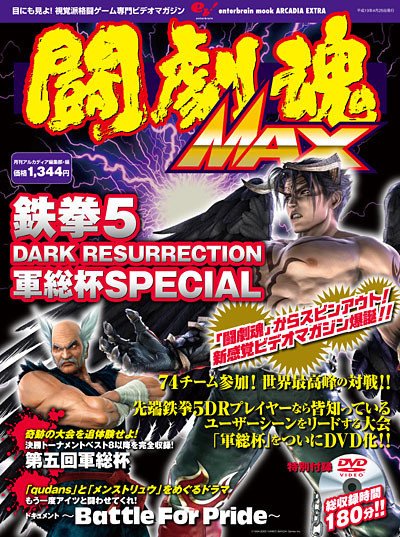 Also released recently in Japan was the DVD for the Gansou Cup Tekken 5: Dark Resurrection tournament at Saitama Popy game center. It featured 70 five man squads battling it out for the top spot! Even a team from Korea led by Qudans, the #1 Tekken player in the world, attended the event! More info on it here. how come leo is a girl? yeah where’s the evidence that says leo’s a gir? Just relax . You can do it .